I have been in Athens since late last Sunday night to attend the TBEX (Travel Blogger Exchange) conference happening from October 23 to 25. I’m staying in an AirBnB apartment 10 minutes walk from the Megaron Convention Centre. I spent Monday resting and settling in, checking out the neighbourhood’s coffee shops, buying some groceries, and so on. 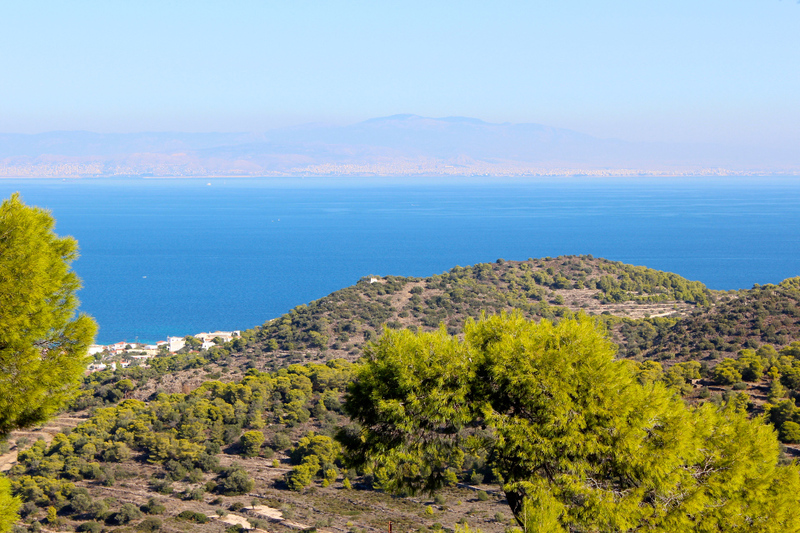 On Tuesday I got up super early (5.45 am) to join my first pre-TBEX tour: an all-day sailing trip to Aegina island with Grazy Travel. 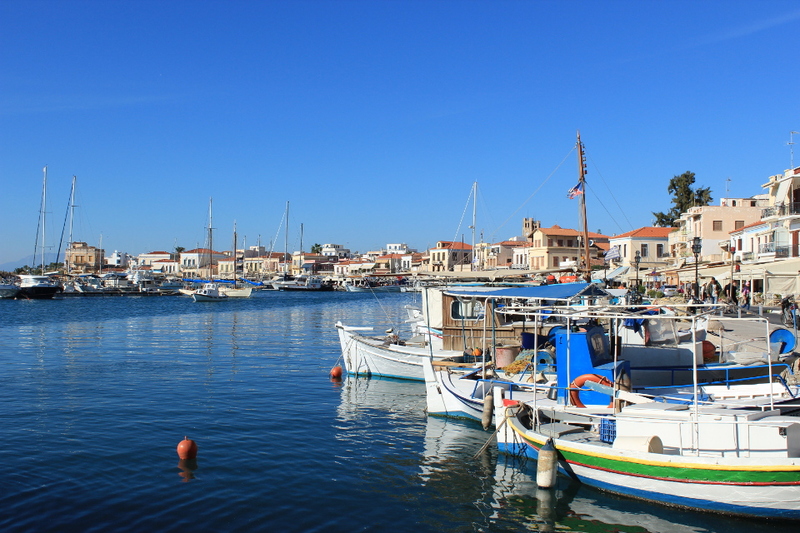 Aegina is part of the Saronic group of islands, a short distance by ferry from Athens. 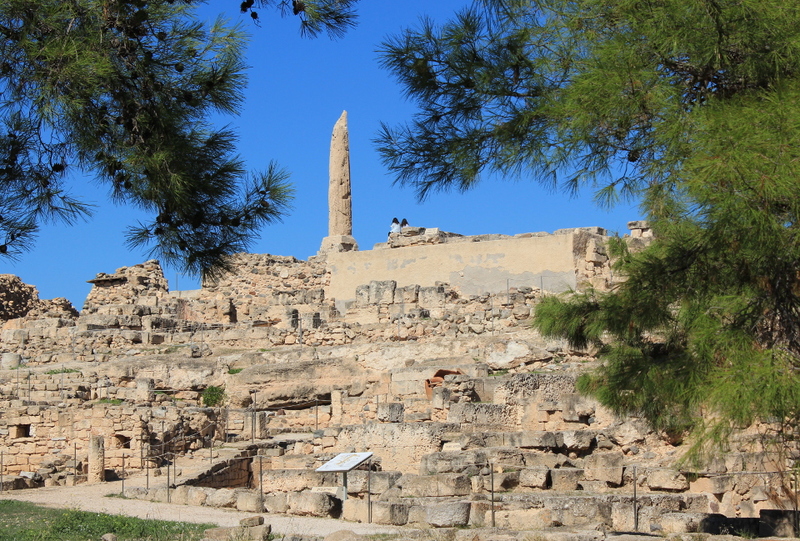 It is a common escape for Athenians, but little known by foreign tourists. 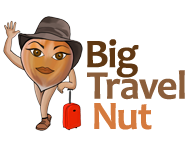 Grazy Travel is a travel company organizing great and crazy travel in Greece! They generously sponsored this excursion for 16 lucky (and quick to sign up) TBEX attendees, including myself! It was still dark when I arrived at the meeting spot at the downtown Athens InfoPoint. Fortunately I had made the same trip the day before to pick up my TBEX Welcome Kit (full of goodies such as a 5-day public transit pass). A bus was waiting. Most bloggers already inside were still half asleep, and we were all thinking the same thing “Man, I need a coffee before I can start chatting up all these strangers!”. 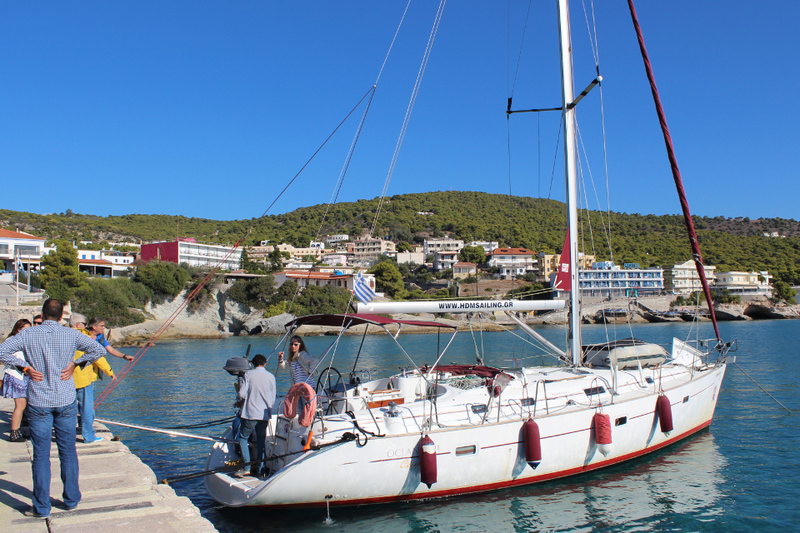 We sailed from Alimos Marina (not from the much bigger Piraeus) on two 14 metre sailboat sitting a maximum of 8 passengers each. Our boat had a crew of two: Lykourgos and Ioannis. 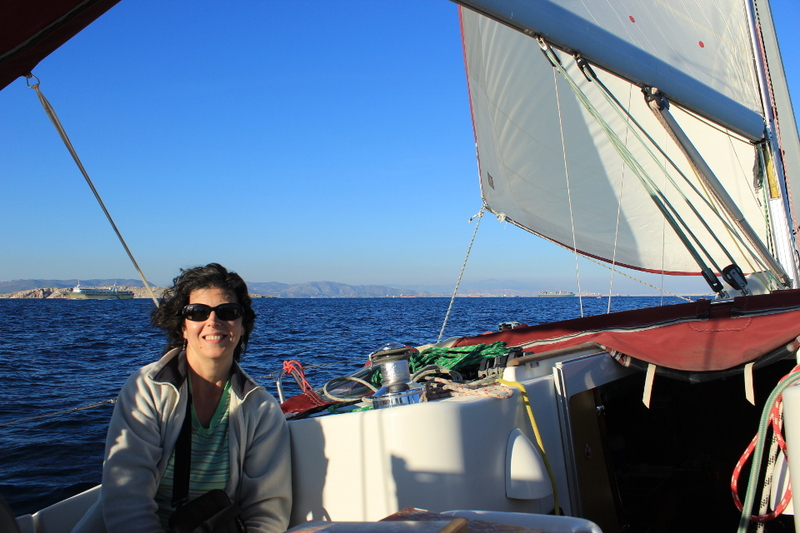 We travelled for about two and a half hours with the motor on because the winds were too light to really sail, but the sunny mild weather and blue Saronic sea turned out to be very enjoyable. Of course the seven bloggers on my boat, all women, got to chat with each other. We were presented with coffee, orange juice and six boxes full of Greek pies (spinach, cheese, meat) but I only had one to be on the safe side. As you may know, I am prone to motion sickness, and despite taking medication that morning, I didn’t want to tempt fate! 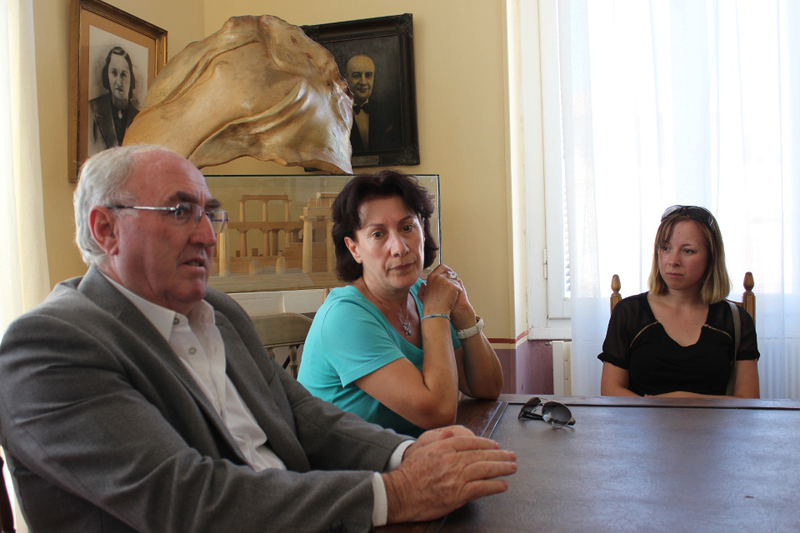 Upon arrival on Aegina, we were received like celebrities. 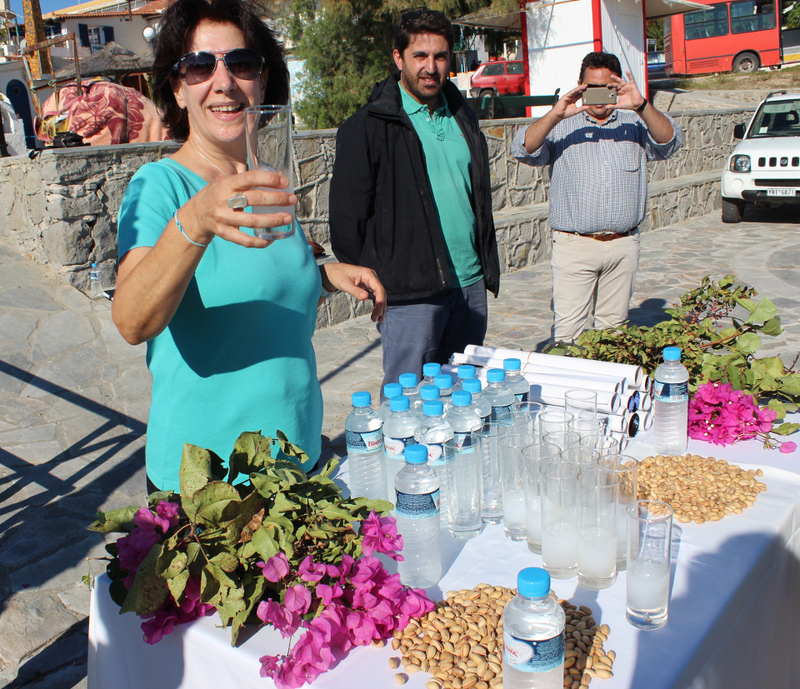 Right where we docked, a table had been set up with pistachios (a local product), flowers and ouzo! It was a bit early to drink, but most people took at least a few sips. 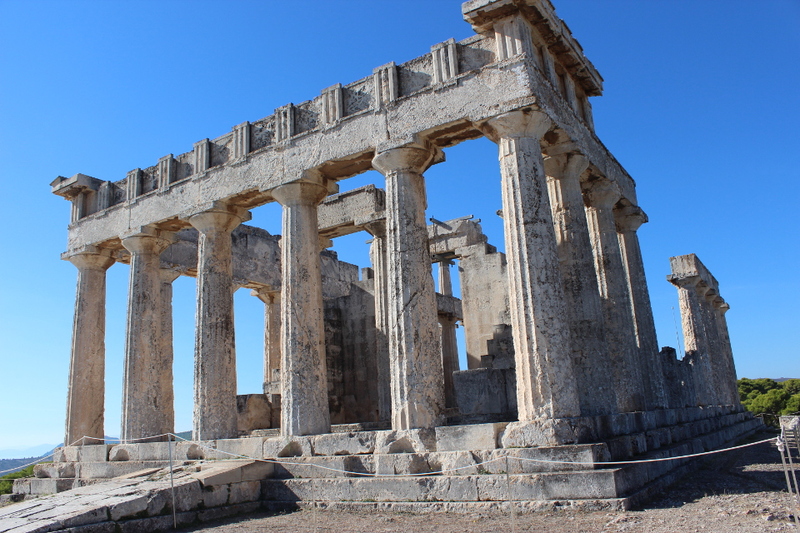 Then we boarded a bus for a whirlwind tour of the island, starting with the beautiful and completely untouristy Temple of Aphaia, dating back to around 500 B.C. 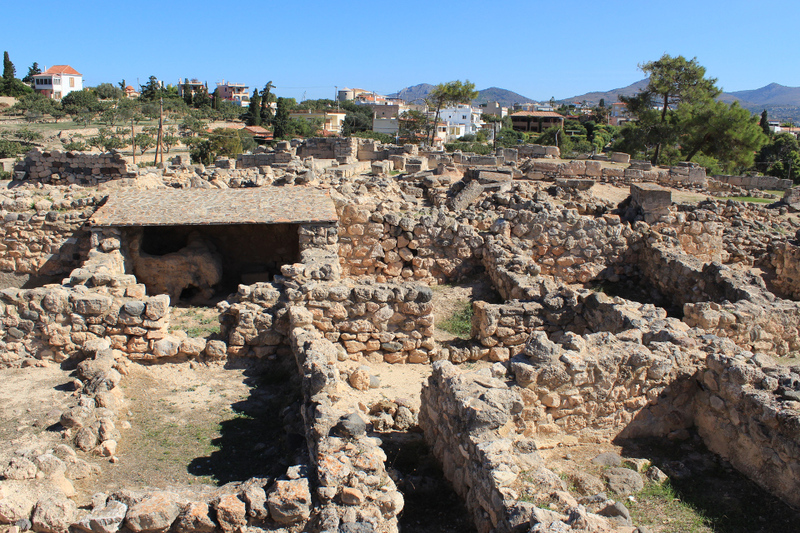 The interior of Aegina is mountainous and from the temple site, we had views down to the beautiful blue sea. 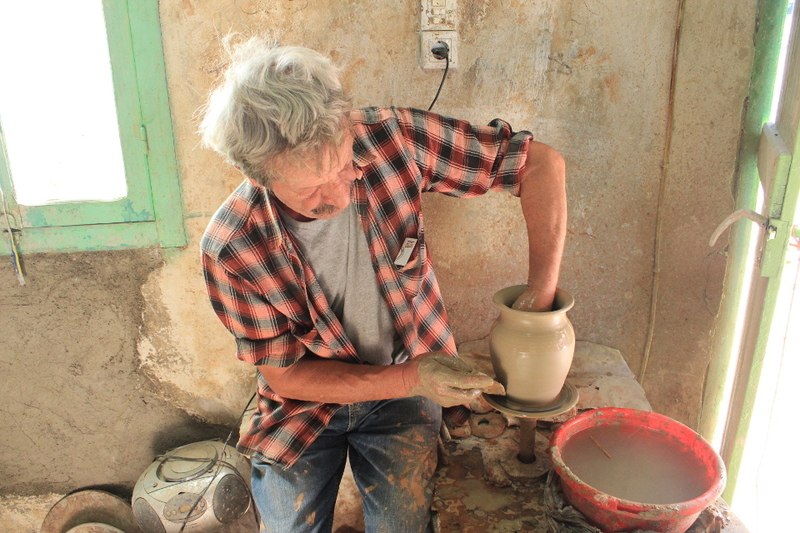 Next we stopped at a ceramic shop where in five minutes, an old man produced a vase from a ball of clay. 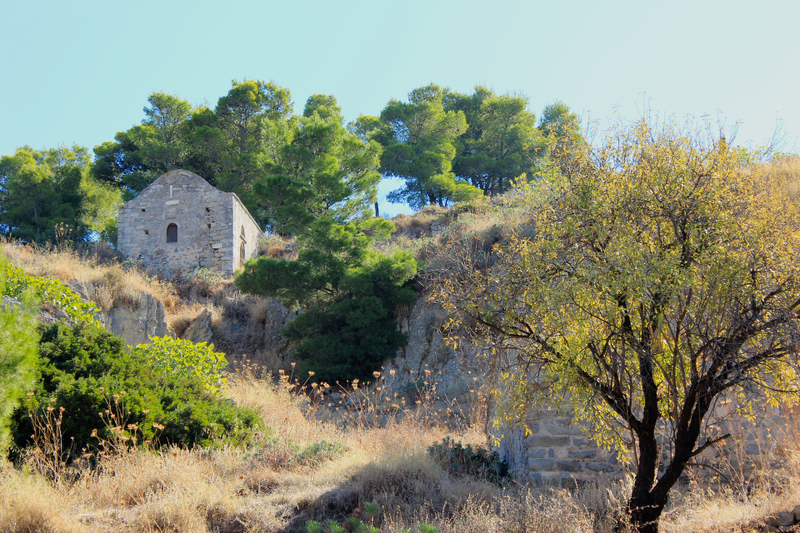 This was followed by an exploration on foot of several little churches that still dot the mountainside where the village used to be located between 800 and 1800 A.C. when the inhabitants feared pirates and invaders. Only ruins of some houses remain, but a few little churches, still showing traces of 14th century frescoes, have been maintained. 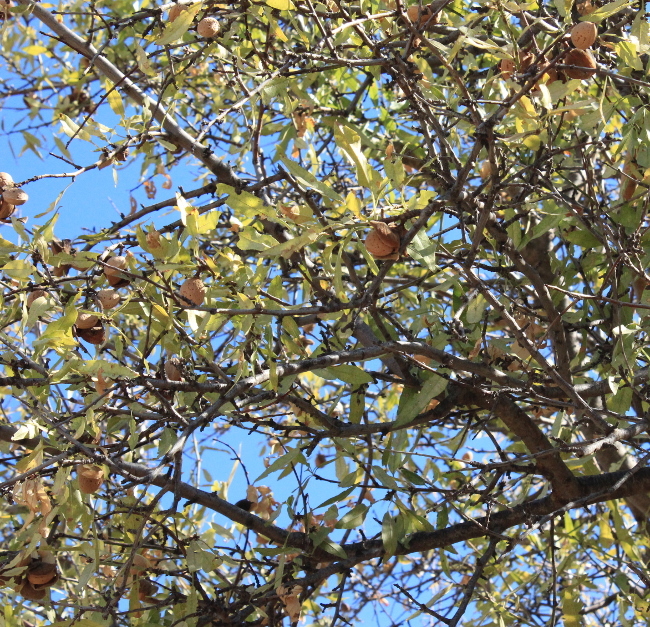 Among the needle trees that cover the mountains, we also found almond trees, complete with clusters of almonds! Driving back toward the coast we made a quick photo stop at the Church of St Nektarios, a “new” Orthodox church built in 1994, saw the remnants of a Jewish synagogue mosaic floor, as well as the archeological site of Delphinios Apollo, where a single column still stands among the ruins (giving it its more common name of “Kolona”). By that point everybody was hungry, but we were told we had to make one more stop before lunch: the Mayor’s office, where the mayor himself wanted to meet us bloggers! As the mayor spoke about his island, our guide translated into English, and we were all handed a souvenir T-shirt of Aegina. Finally we had lunch at a taverna along the main road. 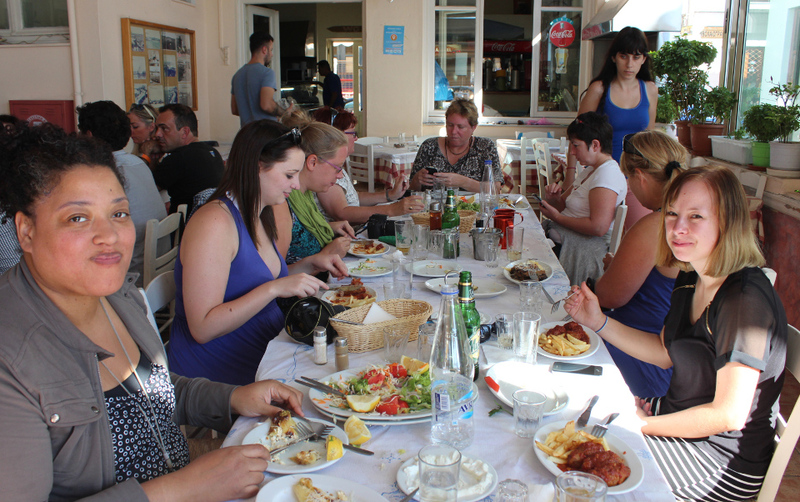 Unlike the sightseeing, the lunch was leisurely (this is Greece after all) and we were served the obligatory “raki” (strong alcoholic cure-all) followed by a yoghurt and cucumber dip, salad, fried zucchini, and a main course of our choice. I had meatballs in tomato sauce and potatoes. Wine and beer were brought to the table as well. 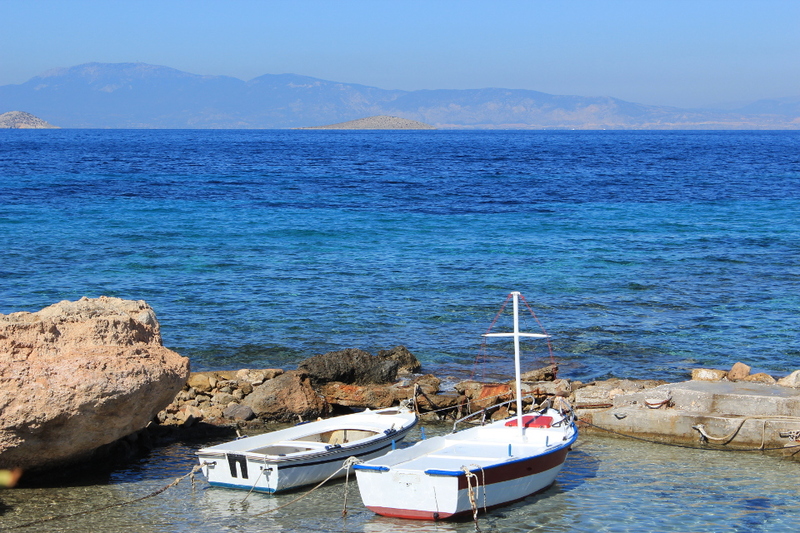 If you want an untouristy island close to Athens, go to Aegina. By ferry or hydrofoil, the trip only takes 40 to 95 minutes each way. The water is beautifully clear, but the only beach I saw looked muddy and not all that appealing. 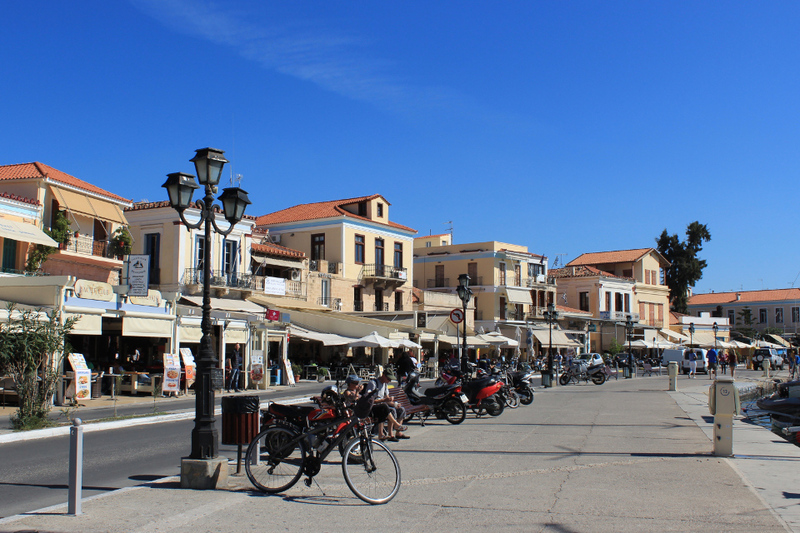 But if you want an island that still feels “Greek” and is doable as a day trip or a week-end trip, Aegina will fit the bill. 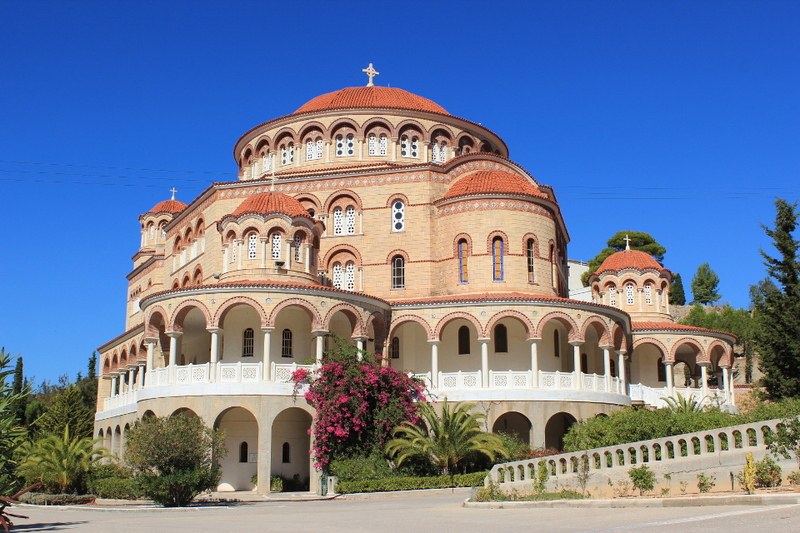 For more information, you can also check out this complete travel guide to Aegina. This trip was sponsored by Grazy Travel. However all opinions are my own. Wow! What a gorgeous place. I need to move there. Good story! I have been on the trip too! I will post my story coming week. Nice to have met you! See you maube on the next TBEX conference? Hey Marion! Nice to see you here on my blog. 🙂 I’m just back from the Pelion FAM trip. So much has happened this past week and I have so much to write about! Will you be going to the Costa Brava TBEX? Good story! I have been on the trip too! I will post my story coming week. Nice to have met you! See you maybe on the next TBEX conference?